Do you have a local business or one that targets audiences in a particular location? If you do, then you need to go a bit deeper with your search engine optimization strategy. There are several things you can do to help your customers find you online and here are five crucial tips on how to make sure you’re attracting as many clicks as possible. To improve your site you first need to determine which keywords and words to use. Keep in mind to improve for local internet search you need to pay attention to words which are appropriate to both your market and place. For example, say you own a local air conditioning business which operates across the UK. When you’re putting together your optimization strategy, look at Geo specific keywords + air conditioning using the Google Ad Words Keyword Tool. The numbers may not be 100% accurate but from the above data you can see that London air conditioning is searched for more than the other locations. You can also use the additional keyword ideas provided below the search terms table in Ad Words. Another good way to get keyword ideas is to simply type in your main keyword in Google search and then check out the related searches at the bottom of the page. Of course, there are plenty of other keyword researching tools that you can use to develop the right keywords for your local search engine optimization and the more you make use of the better. Once you’ve put together a list with the right keywords, the next thing you need to do is optimize your site for local search. To let search engines know the location you’re targeting, start by adding Geo-specific information and keywords in your title and meta descriptions. Your SEO title tag and meta description will be displayed in search engine results, so make sure these two areas are optimized for local search. This means that your locally optimized title tag should include your main keywords and your location in 70 characters while your locally optimized meta description should also include your address and phone number in a maximum of 165 characters. When you add local address and phone number on your site it’s important not add them in an image, but to have it as actual text. That’s because search engine cannot index images, so they won’t know it’s there. This kind of location information is a strong ranking factor in local SEO, plus people using mobile phones to access your site can actually dial your number by just clicking on it directly from the page if it is in text form. Simply enter your business address on Google Maps and you’ll get an HTML embed code that allows you to add a map on your site. This is not only a great way to have Google know where you are but also to help your site visitors find your location easier. 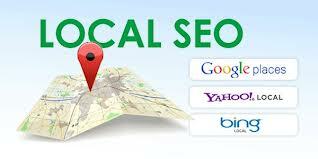 You can also create a Geo sitemap if you want to make sure Google knows where your business is located. You can use the Geo Sitemap Generator to generate this. After you’ve filled in your business details, simply download the two files and upload them to your site’s root folder. Then you need to go to Google Webmaster Tools, add your site and verify it using your Google Analytic code. Under Site Configuration-> Sitemaps add the Geo sitemap’s URL. This is the fastest way to inform Google of your location. Getting your firm to show up in Google Places listing is the best thing that can happen for your business. Why? Because it’s increasing the chances of your local business showing up on the first page of search results, even above some of the organic ones. The first thing you need to do is add or claim your business on Google Places. Add as much information as you can to your profile and be sure to upload photos as well. After you’ve added all the necessary information about your business, you will need to verify your business. You have two options – either verify immediately by phone or wait for two to three weeks for a postcard by mail. Once your Google Place profile is live, there is another important thing you should do and that is to encourage your customers to write reviews about your business and the products or services you provide. If you happen to also get some bad reviews, don’t just leave them there. Reply and try to come up with a solution for these unhappy customers. This way you can help your former customers and, at the same time, prove to potential customers that you provide fantastic support. Google Places is the most important place on which to have your business listed but don’t ignore options like Bing Local, Yahoo Local, Yelp, Yellow Page and others. The more listings you have on local directories, the better. With so many people checking in at places using Foursquare, you need to add or claim your business on this major social network for local firms. Add all the necessary information about your company and don’t forget to also add a link to your website. Then ask people to check in at your business, whether it’s a clothing shop, a hotel, a creative agency or an electronics store. At first, you can give special discounts or coupons to people who check in often at your business or to those who check in for the first time. This is an amazing word-of-mouth marketing technique as people tend to go to places their friends have been to and recommend. Was the last look for you performed made from a cellular phone? If the response is yes, then you are aspect of the 61% cellular customers who ran regional queries from their cell cellphone, according to a 2012 research by Localize and 15 kilometers. This number will only improve as more and more people are using cell cellphone gadgets to accessibility the web. That is why you should make sure you website functions well on cellular. A mobile-specific website is better than a conventional website in these conditions as it’s enhanced particularly for small displays, providing customers a better routing encounter. Sensitive design, an growing area in web growth, offers a way to provide cellular customers a great encounter without having to have two individual sites. By guaranteeing your cellular website is enhanced in the methods described above, you can entice clients who are looking for a business like yours even while they are strolling down the road. If you make sure you follow the five tips above, you should see an increase in people visiting your site, which in turn will lead to an increase in customers. What strategies do you use to boost local SEO?